NASCAR and NHRA Replica helmets, which are collected by fans, are featured this week. Carl Edwards #19 Comcast Business Toyota Camry-New sponsor for 2015, blue, silver and white, with a stripe that starts on the bottom, covers the car number, and takes over the top at the back. I try to keep things light and fun here on The Driver Suit Blog, but sometimes an on-track situation requires discussion. Last Friday, at Richmond, one of those situations occured. During the Toyotacare 250 at Richmond, there was a huge fire on pit road during a round of pit stops, where three crew members were injured. I will let the footage speak for itself.A total of three crew members were hurt, and NASCAR has stated that they will fully investigate what happened and will make sure this won’t happen again. While the crew members were hurt, it could have been so much worse. If the rules about pit crew safety were as lax as they were in the 1990’s, this would not have a happy ending. Watching some of these older videos, and there are plenty of them on the internet, it’s amazing there aren’t more dead pit crew members. I’ve seen pit stops where the crew members were wearing little more than what I wear to my job. 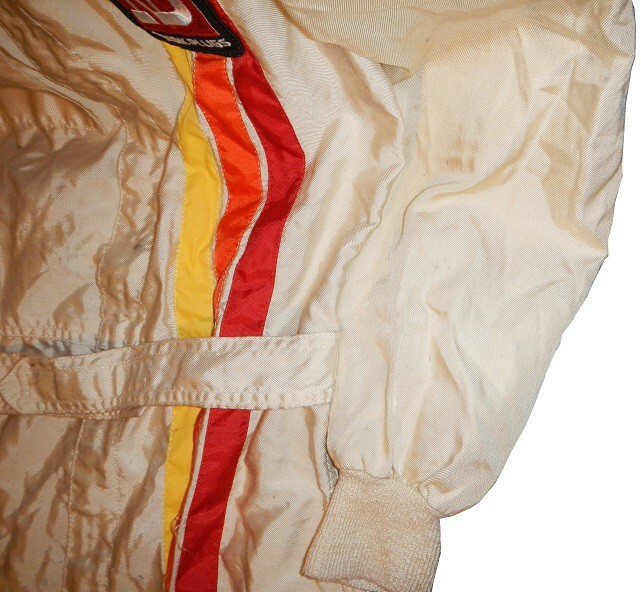 The crew members in question were wearing two piece fire suits, triple layer, which took the brunt of the damage. The crew members did have to go to the infield car center and then the hospital, but they will live to tell their tale. These suits might not be the most comfortable things to wear, but they will save your life. 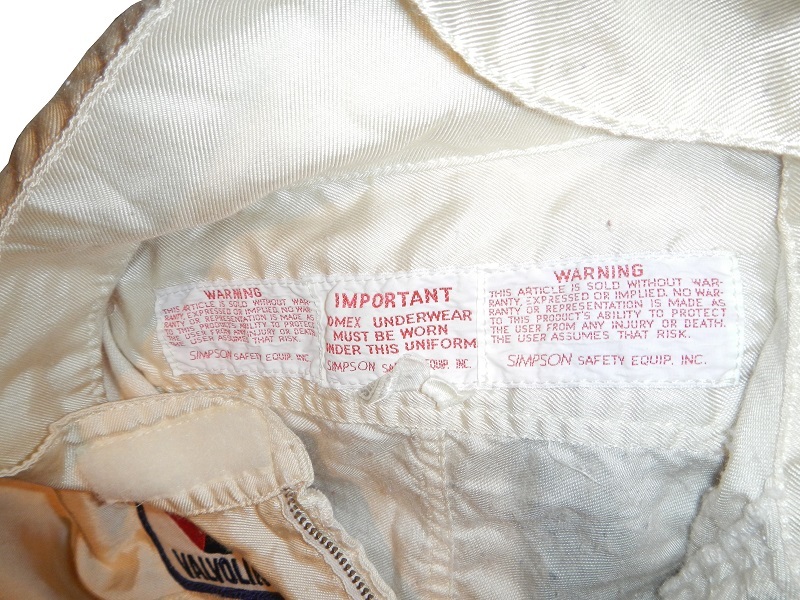 Nomex was a Godsend to racing in 1967, and 38 years later it is still the go to material for driver and pit crew suits. My thoughts and prayers are with the crew members. 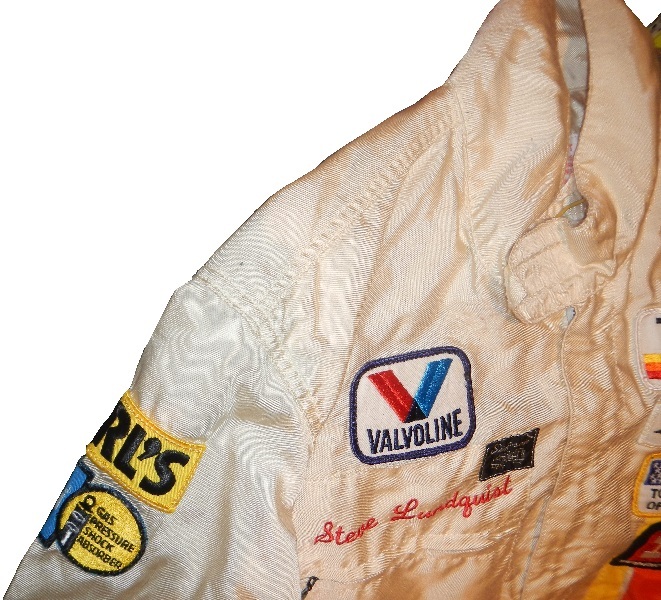 I had a post ready for Friday, but I’m gonna revisit a pit crew suit post I did last year because of the incident at Richmond. 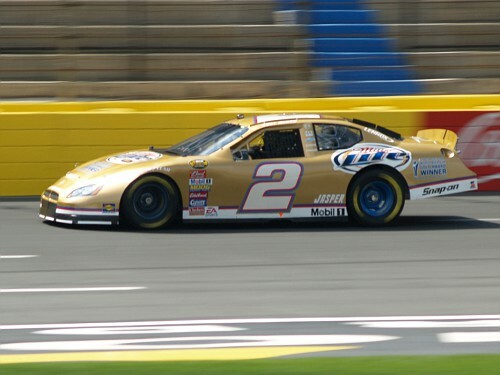 In a 10 lap race that saw some crashes and some great racing, Alfonso Ribeiro was the overall and pro winner, with Dave Pasant wining the celebrity category. When you race in the Toyota Pro/Celebrity race, you get to keep your driving gear. I discussed this in my Steve Lundquist article. He won two gold medals in the 1984 Olympics in swimming, then came back and raced in the 1985 event. The competitors are given special training and safety instructions. Even though there have been a decent number of crashes, no serious injuries have occurred. 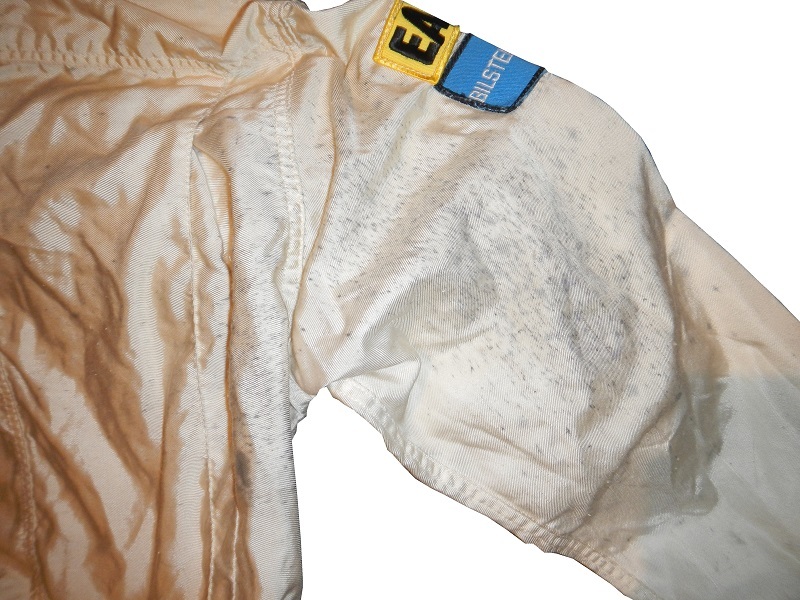 This single layer suit shows heavy use, with stains and scuff marks on the arms. It has a nice vintage look to it. 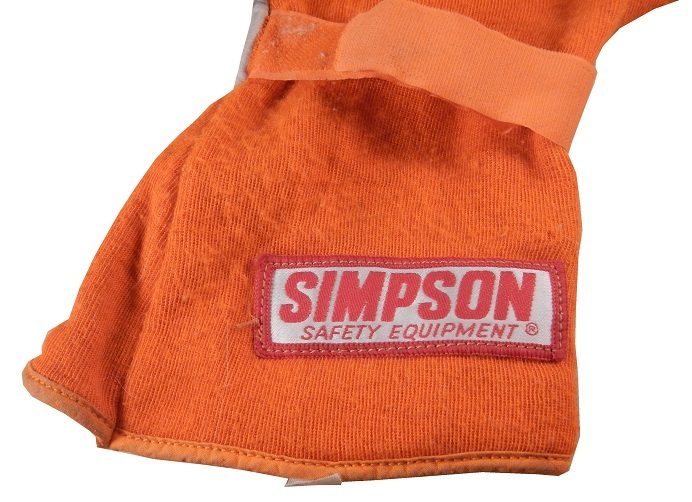 The cowl contains an older version of the Simpson warranty label. 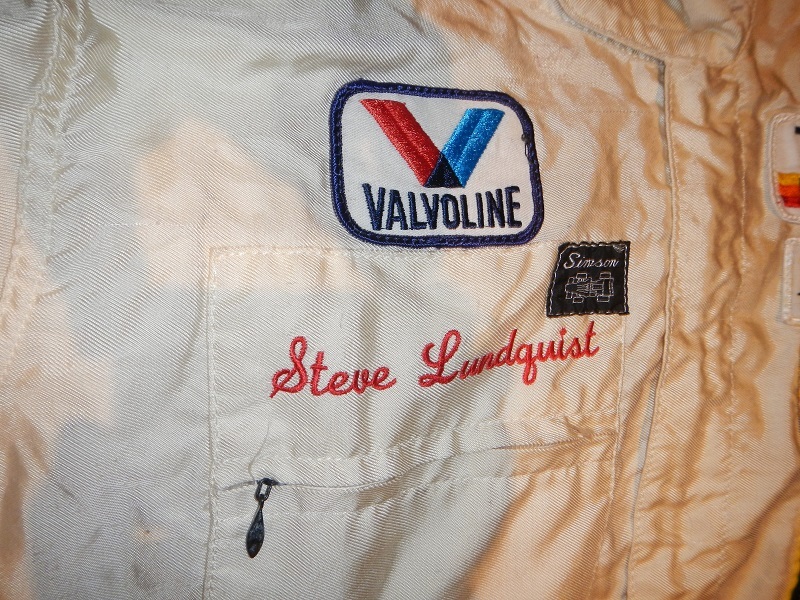 the right chest features a VALVOLINE logo and STEVE LUNDQUIST embroidered into it. 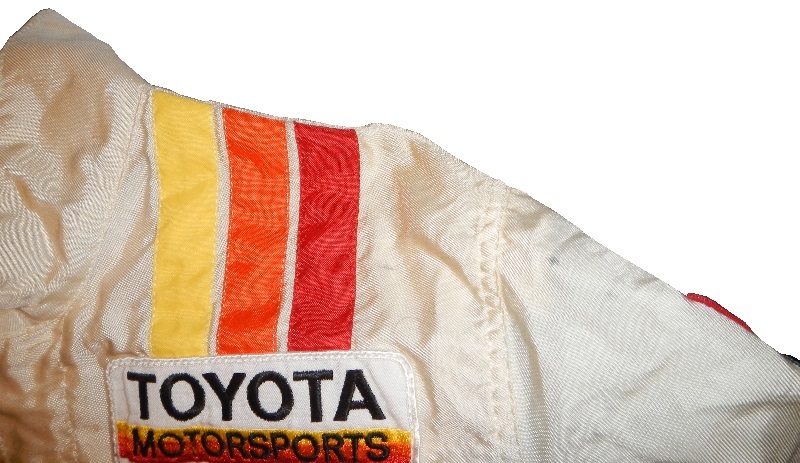 The left chest features a vintage racing stripe design, with TOYOTA MOTORSPORTS, BRIDGESTONE, GRAND PRIX OF LONG BEACH and ND SPARK PLUGS patches on the stripes. 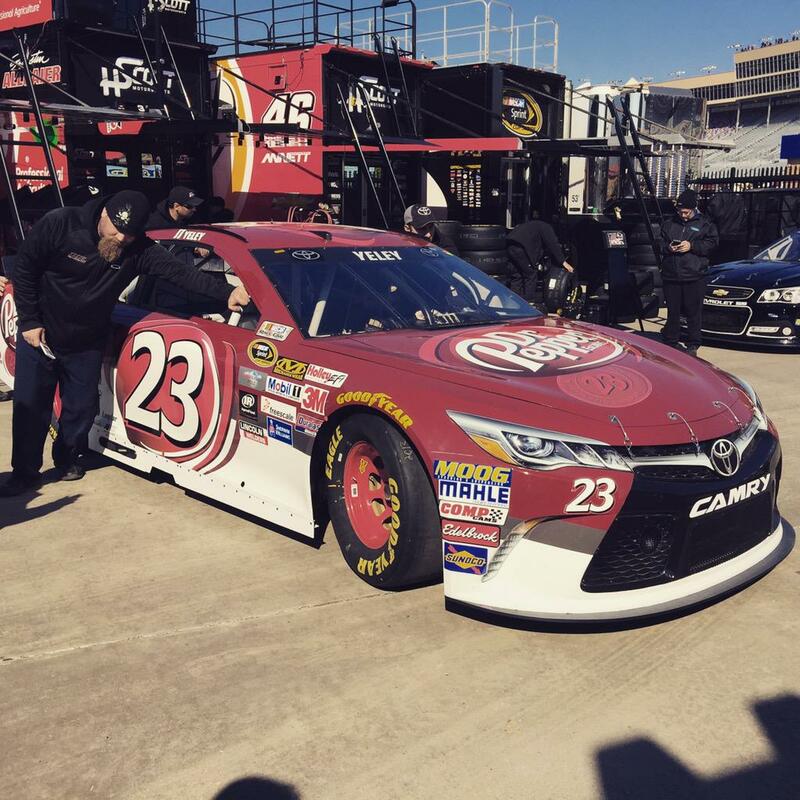 As there are no primary sponsors of the cars, there are no logos on the torso as primary sponsors. The rights shoulder does not have an epaulet, or any adornment. 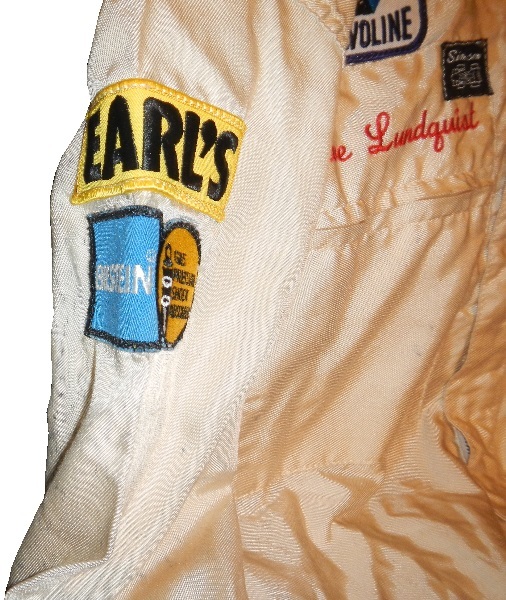 The right sleeve has an EARL’ S patch and a BLISTEN SHOCK ABSORBERS patch. 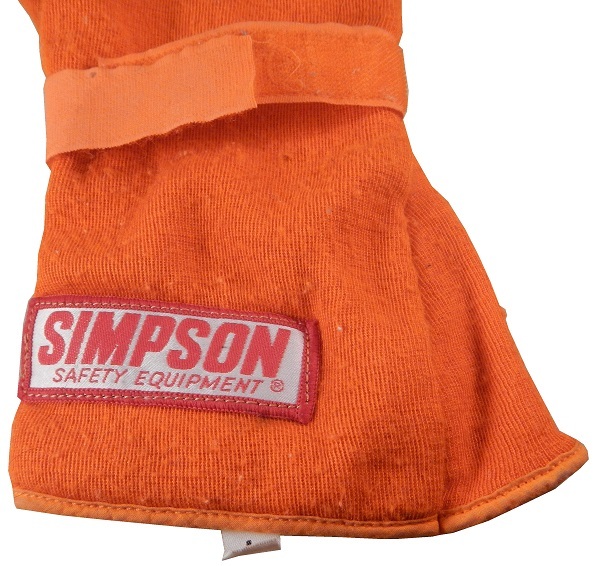 There are no logos at the end of the sleeve, and heavy wear on the back of the sleeve. 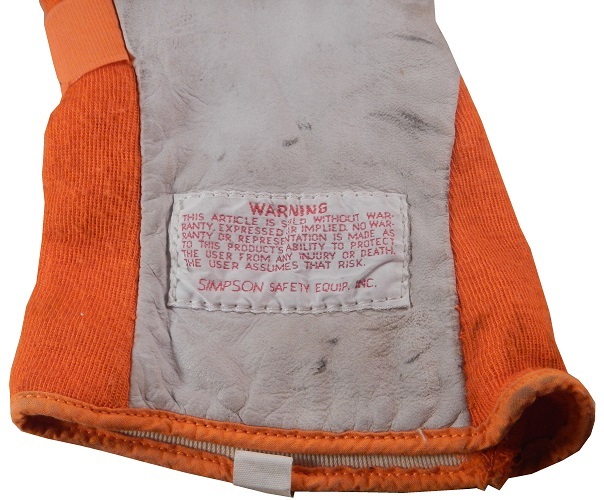 The left shoulder, like the right shoulder does not have an epaulet. 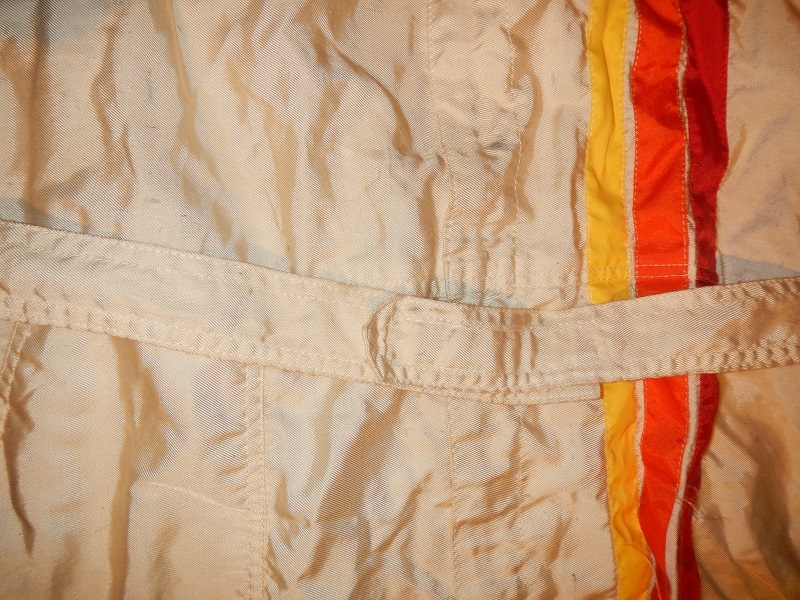 The stripe pattern terminates at the hem of the shoulder. 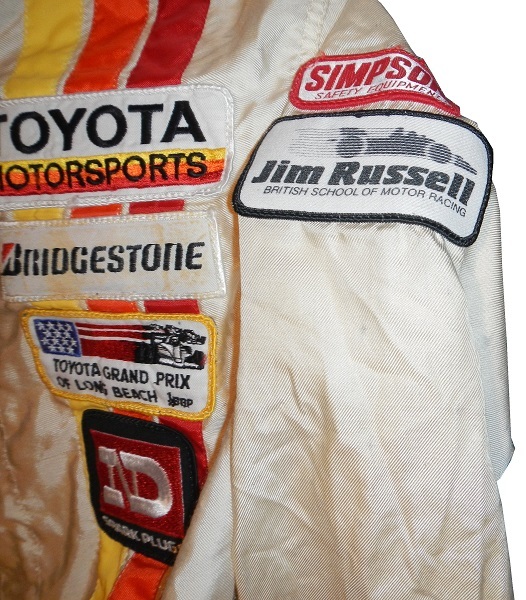 The left sleeve features a SIMPSON RACE PRODUCTS patch, and a JIM RUSSELL RACING SCHOOL patch. There isn’t much wear here. 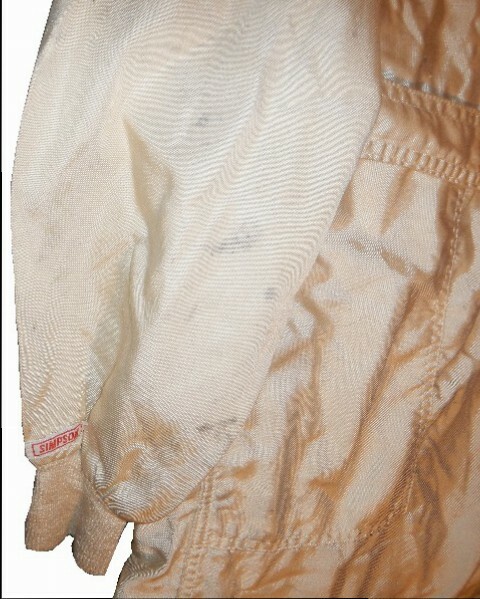 The back of the suit shows no real wear, and has no patches or design present. 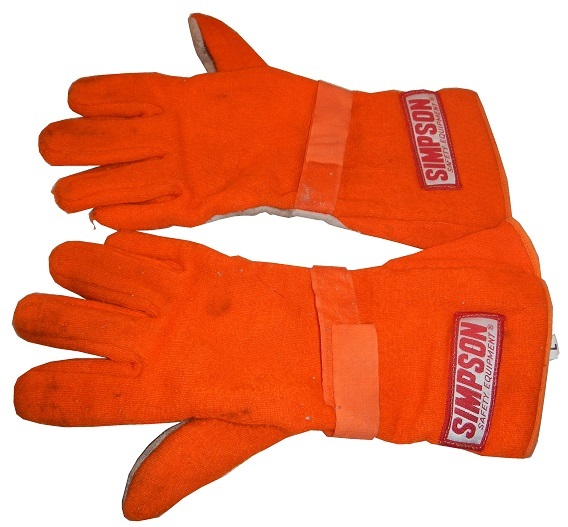 This set of orange gloves came with the suit. They show decent use. 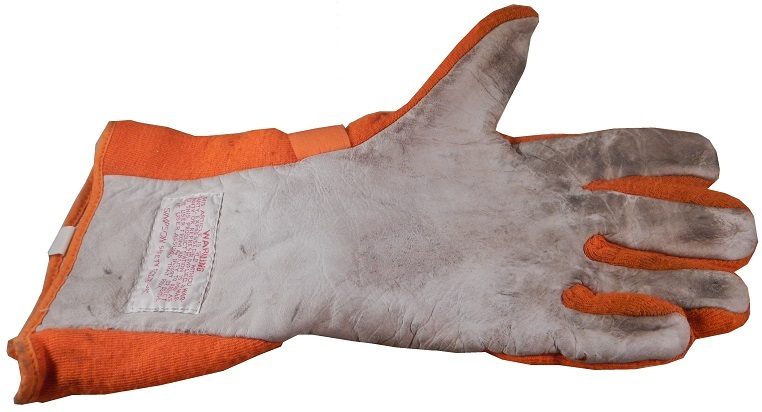 These come up for auction every now and again, and I personally like them as they are racing memorabilia and celebrity memorabilia at the same time. NHRA driver TJ Zizzo is featured this week, with a video devoted to his memorabilia. Got a few things this week. The joke is that with April showers come May flowers, and the April rain delay tour showed up again, this week at Bristol. 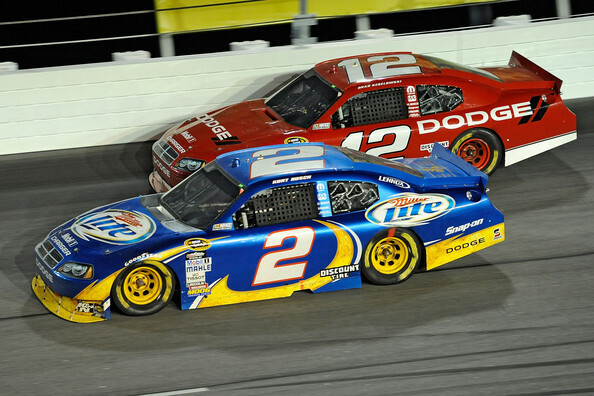 Unlike NOLA Motorsports Park, Bristol made damn sure that the track was clear and ready for racing, and delayed the restart of the race until it was. The race was a traditional Bristol short track race and though rain was an issue the race was good. Across the country, at Long Beach California, the Grand Prix of Long Beach and the Toyota Pro/Celebrity Race was held. Unlike Bristol, the weather was great and the racing was even better. When it comes to rain delays, they don’t bother me, because I care about the safety of the drivers. Last year’s Japanese Grand Prix shows why you shouldn’t force the race in bad weather. Jules Bianchi paid the price with his racing career and nearly his life when he lost control in the bad weather conditions, and slammed into a tractor. That was a wake up call that weather should be respected, and safety should be the top priority in racing. 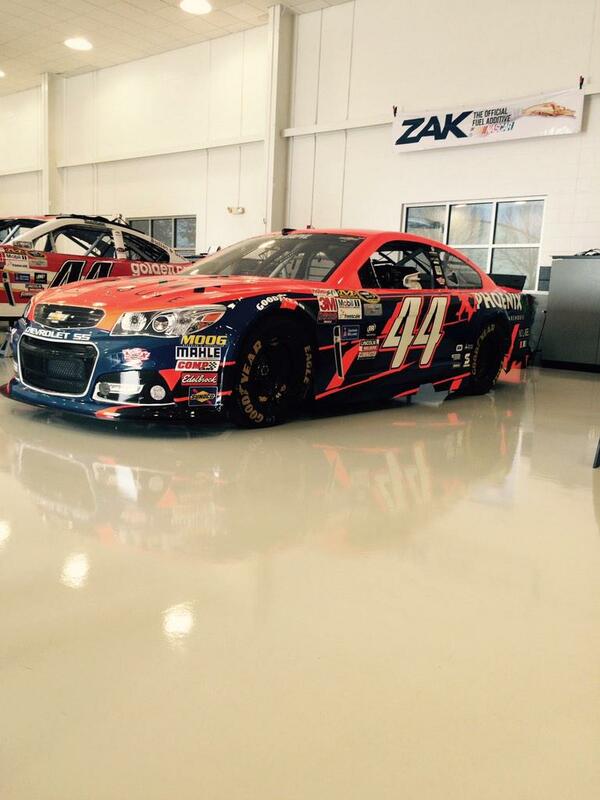 Between that, and the Kyle Busch wreck at Daytona, there is a new focused effort on safety, that I’m a fan of. Next, I’d like to talk about social media, specifically Twitter. 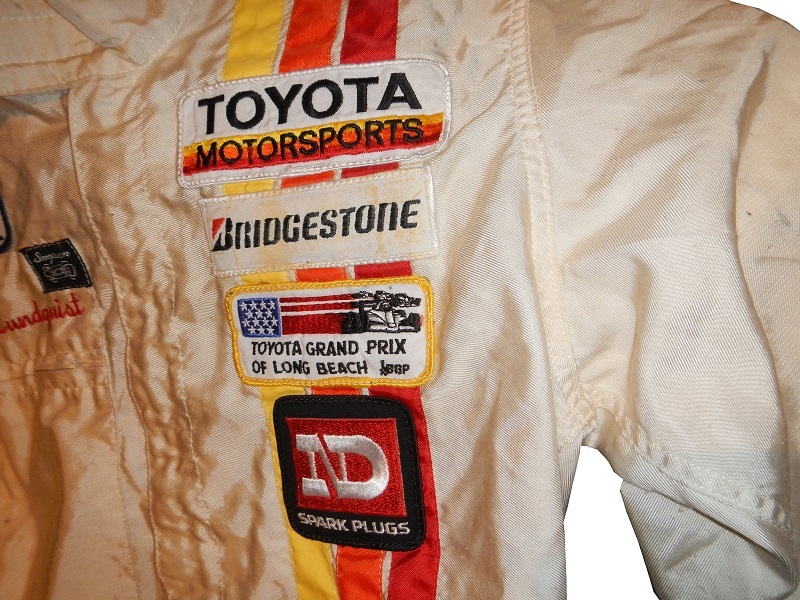 I have a Twitter account for myself and The Driver Suit Blog but I rarely tweet anything. When I tweet or post stuff on Facebook, I usually stick to just goofy and fun stuff. What I don’t understand though is when Twitter went from fun way to communicate to legitimate journalism. CNN, ESPN, Fox News, MSNBC, and all the major news groups use Twitter as a news site. I wish they wouldn’t. I like places on the internet where you can escape the problems of life for a while, and social media used to be like that…oh well. Sam Hornish Jr. #9 Nature Blast/Medallion Bank Ford Fusion-Horrible color scheme, and terrible design will always earn an F.
Jeff Gordon #24 Axalta/Penn State Chevy SS-The color scheme is good, but the side design is a bit too overdesigned. It earns a B+. Ryan Newman #31 Caterpillar Throwback Chevy SS-An amazing look, a great throwback logo, a good color scheme, and the best damn shade of yellow I’ve seen all year earns an A+. Ryan Newman #31 Wix Filters Chevy SS-Same scheme as last year, same F grade. Cole Whitt #35 Tweaker Energy Shot Ford Fusion-A good smooth design with a great color scheme will always earn an A+. Michael Annett #46 Philmor Chevy SS-decent color scheme, horrible design scheme, and it earns an F.
Justin Allgaier #51 Auto-Owners Insurance Chevy SS-This is a redesign of the 2014 scheme, and the needless redesign with the extra stripes and the extra shade of blue takes it from an A+ to a B+. 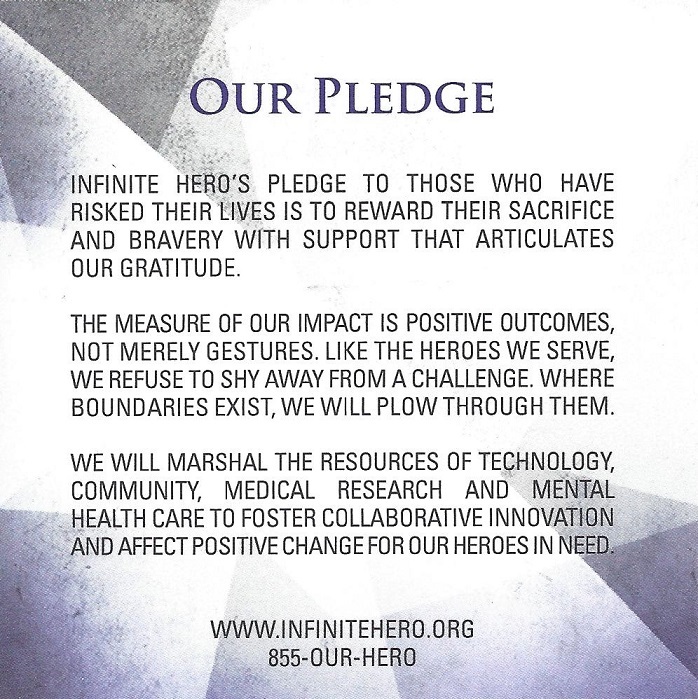 Launched in 2011, The Infinite Hero Foundation “…is to combat the most difficult front line issues – mental and physical – facing returning military heroes and their families.” Military personnel returning from overseas deployment face long term employment, mental and physical problems that the majority of Americans don’t understand. They work with other non-profit veterans groups and give out grants to help service men and women cope with these long term problems. 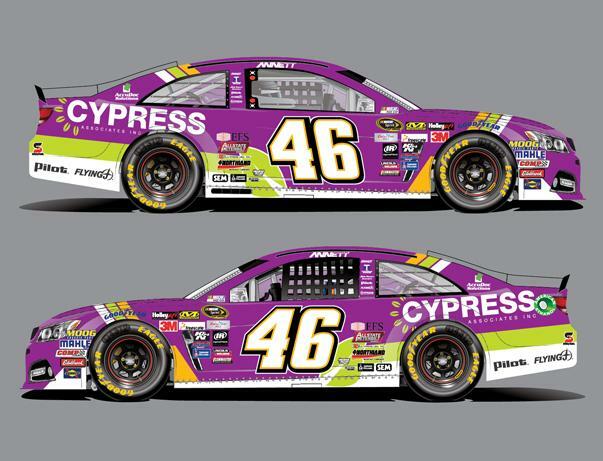 In April 2014, they started sponsoring Jack Beckman’s funny car. This also began the NHRA coin program. 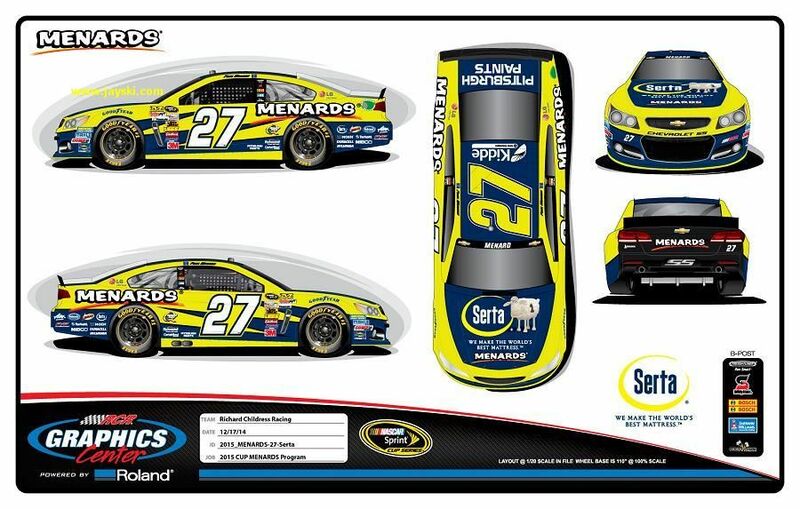 This is a new form of racing memorabilia I have never seen before, though it’s a great idea. 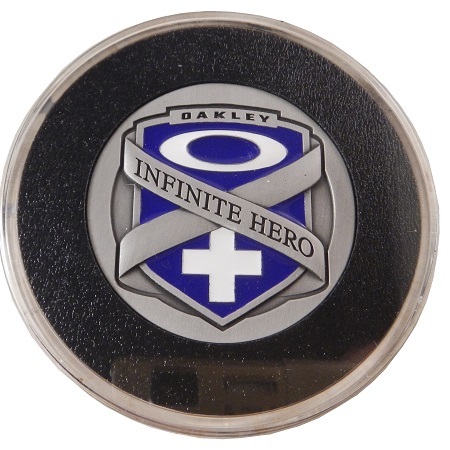 When Jack Beckman gets into his funny car to race, he carries at least 5 Infinite Hero Challenge Coins in the pocket of his driver suit. Once the race is over, he will autograph them and sell them at the track and on eBay. 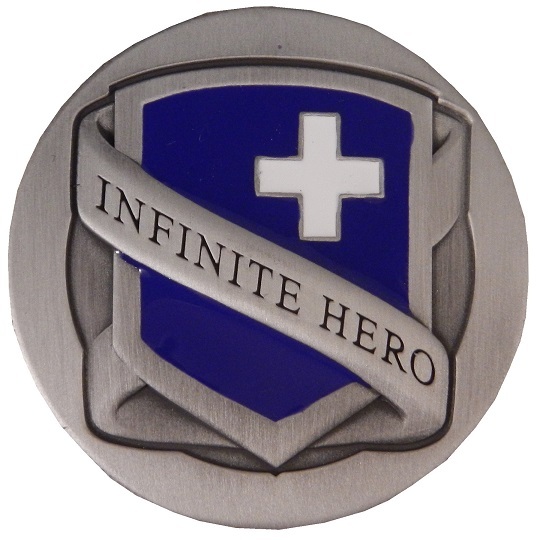 They cost $100 with all proceeds going to the Infinite Hero Foundation. The idea of items carried in a pocket is not a new one. NASA has done this for years. Many space shuttle flights carried first day covers in the storage bay. When the shuttle landed, the covers were removed, and sold to collectors. 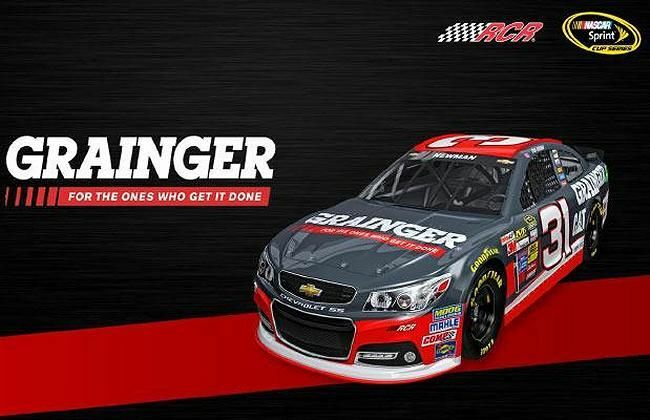 I’m a little surprised this hasn’t been done before with auto racing, because I think that it would create a new memorabilia market. The 2014 design is slightly bigger than a quarter, but not as big as a half-dollar. It is quite thick, and has a ridged edge. 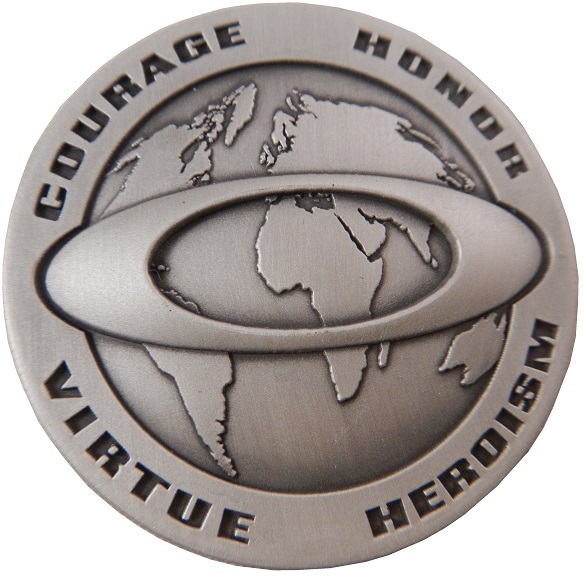 One side featured “Courage, Honor, Virtue, Heroism,” around a globe design with an Oakley logo. 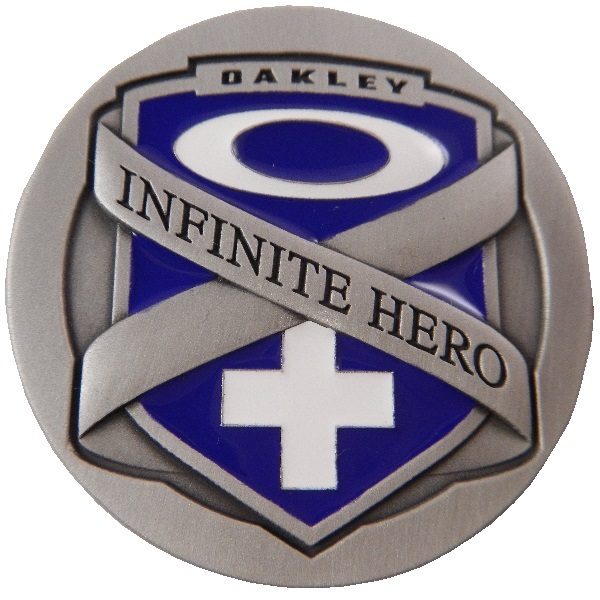 Oakley is a partner with the Infinite Hero Foundation. 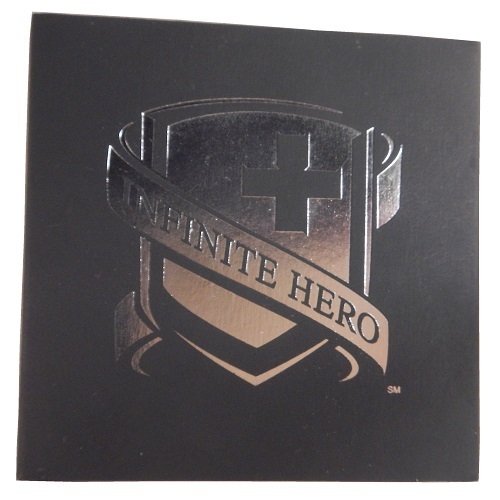 The other side features an embossed Infinite Hero Foundation logo. 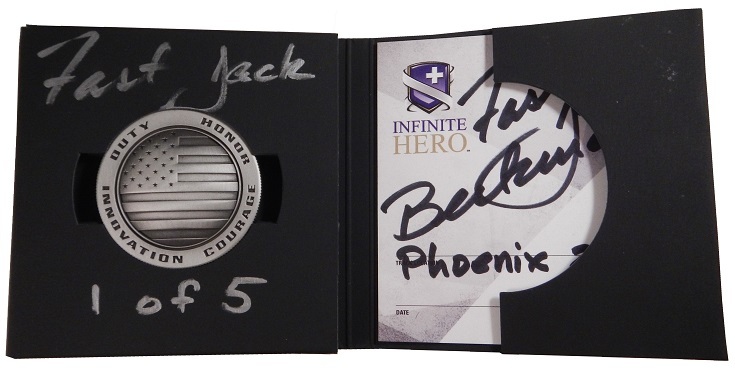 The coin was placed in a round, flat plastic container, with black foam braces, which Jack autographed. 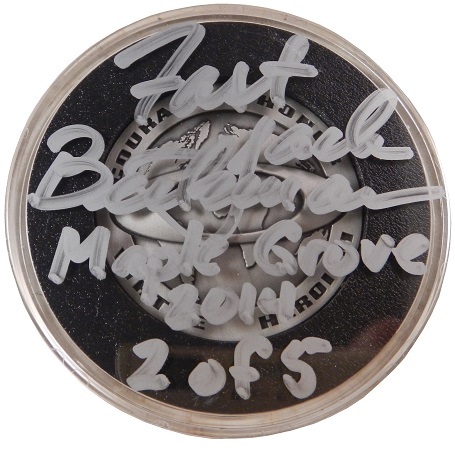 This particular coin was used at the 2014 Auto-Plus NHRA Nationals at Maple Grove in Reading Pennsylvania. A redesigned coin of the same size was introduced for 2015. The Oakley logos are gone. One side features a design similar to the globe design, but the globe design has been replaced with an American Flag design. 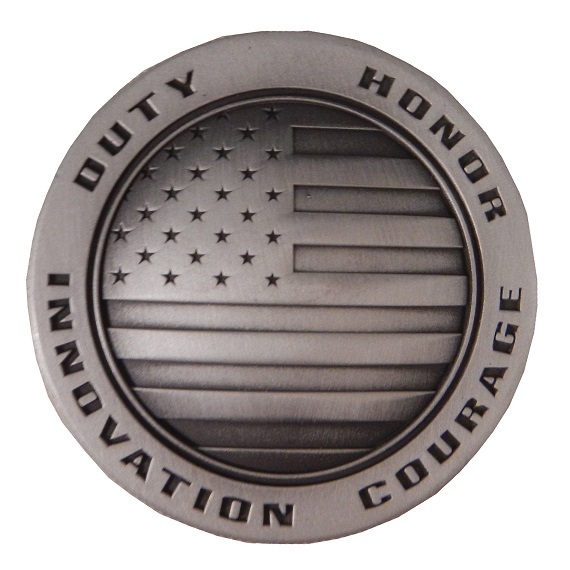 “Courage, Honor, Virtue, Heroism” has been replaced with “Duty, Honor, Innovation, Courage.” The new emblem on the reverse side has one of the across bands removed. The new packaging is an upgrade, with the circular plastic cylander replaced with an attractive box. 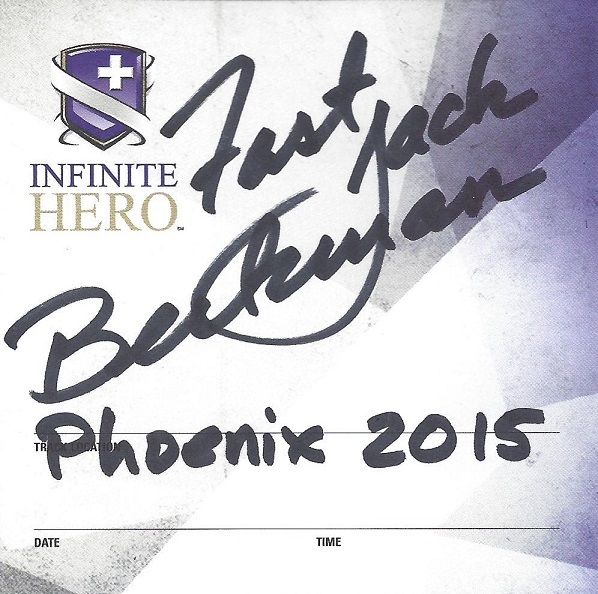 It comes with a card that Jack Beckman autographed, and on the reverse it has the Infinite Hero Foundation Pledge. 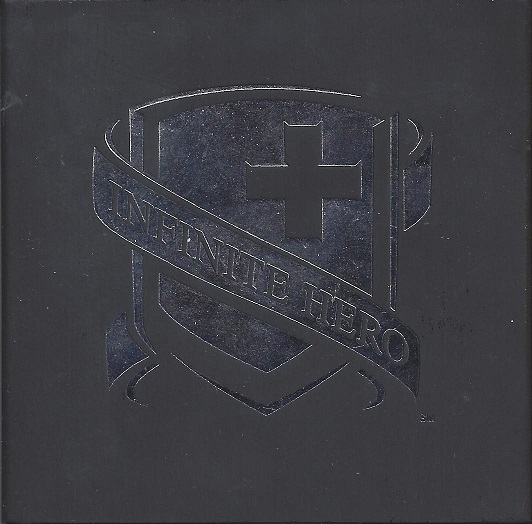 The Infinite Hero Foundation is a worthwhile charity, designed to help our nations veterans. I fully support them, and I encourage my readers to try and buy at least one of these coins. 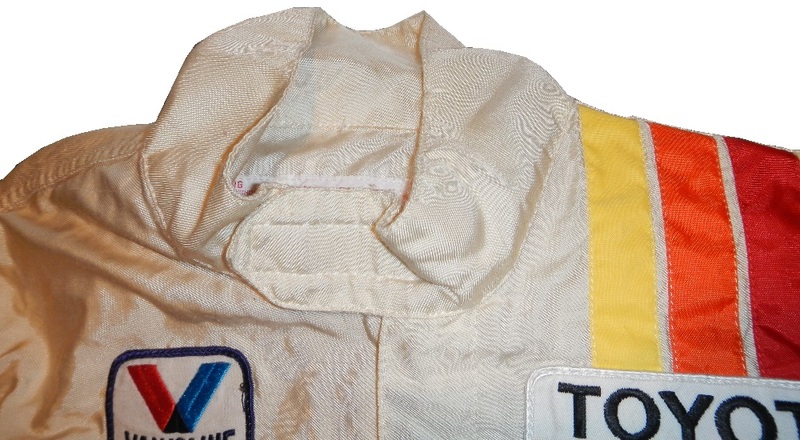 Pac West Racing was sponsored by Bank Of America in 1995, and the pit crew wore this suit while changing tires.